return is like an ancestor is coming back home." Rosita Worl, president of the Sealaska Heritage Institute. Two Alaska Native artifacts -- a small wooden mask believed to have been carved by members of the Chugach tribe, and part of a wooden box believed to be from the Chilkat Tlingit tribe -- have been returned to two native organizations after being purchased at a Paris auction house. 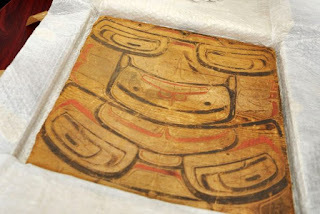 The Sealaska Heritage Institute* had asked the unnamed Paris auction house to stop the auction when the box piece was discovered on the company's sale list, along with artifacts from the American Southwest. The auction house refused. There was then some behind-the-scenes intervention from the U.S. State Department and a purchase by the Los Angeles-based nonprofit foundation the Annenberg Foundation. Using foundation money, the group was able to anonymously purchase 25 of the 27 Native American artifacts for sale at the 2013 auction. Both the box piece and the Chugach mask were returned to Alaska in August. The remaining 23 items are from the Hopi and San Carlos Apache tribes of Arizona and will be returned to tribe members there soon. the small wooden slab was once part of box that was made by steaming and bending wood. It would have likely been used to transport sacred objects belonging to one of the Chilkat clans that now populate the Haines and Klukwan area. [...] The Chilkat box piece is believed to have been made in the early- to mid-1800s, a time during which [...] Alaska Native artifacts were heavily, and illegally, collected. "It could have been taken from a grave," Worl said. "Often, the box would be left at a shaman's grave until a spirit came as a successor, but they were often stolen from those grave sites." The Chilkat box-piece will be stored at the Sealaska Heritage Institute in Juneau. The Chugach mask has been given to Chugach Alaska Corp.